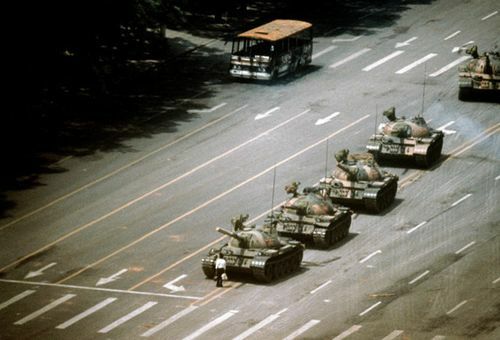 However on 4 June 1989, Chinese troops and security police stormed through Tiananmen Square, firing indiscriminately into the crowds of protesters. Turmoil ensued, as tens of thousands of the young students tried to escape the rampaging Chinese forces. 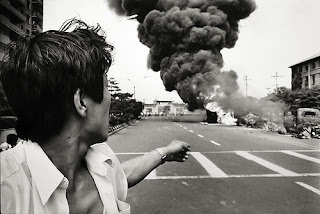 Other protesters fought back, stoning the attacking troops and overturning and setting fire to military vehicles. Reporters and Western diplomats on the scene estimated that at least 300, and perhaps thousands, of the protesters had been killed and as many as 10,000 were arrested. The savagery of the Chinese government's attack shocked both its allies and Cold War enemies. 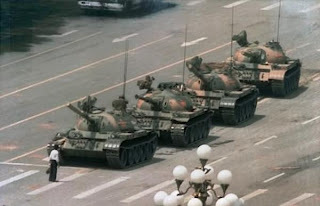 Soviet leader Mikhail Gorbachev declared that he was saddened by the events in China. He said he hoped that the government would adopt his own domestic reform program and begin to democratize the Chinese political system. En uno de los últimos días de estas protestas fue tomada la foto ganadora del World Press Photo de 1989, en la cual se muestra a un joven opositor parado en medio de una avenida deteniendo a una columna de tanques que circulaba por ésta.